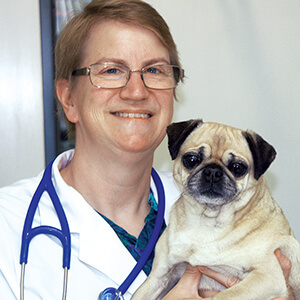 Dr. Donna Dimski is a board-certified specialist in small animal internal medicine and a Diplomate of the American College of Veterinary Internal Medicine. She is skilled in many procedures, including gastrointestinal endoscopy, rhinoscopy and chemotherapy. Dr. Dimski has published and lectured internationally on feline medicine, especially regarding liver disease and nutrition. She received her Doctor of Veterinary Medicine from Texas A&M University in 1985. Following an internship at Purdue University, she completed a small animal medicine residency and a Master of Science degree in Veterinary Clinical Sciences at The Ohio State University. Dr. Dimski served on the faculty of Louisiana State University’s School of Veterinary Medicine, attaining the rank of associate professor. She left academia to practice in Oregon in 1994. She also currently serves on the Board of Directors for Pro-Bone-O, an organization that provides basic veterinary services for the companion animals of Lane County’s homeless population.